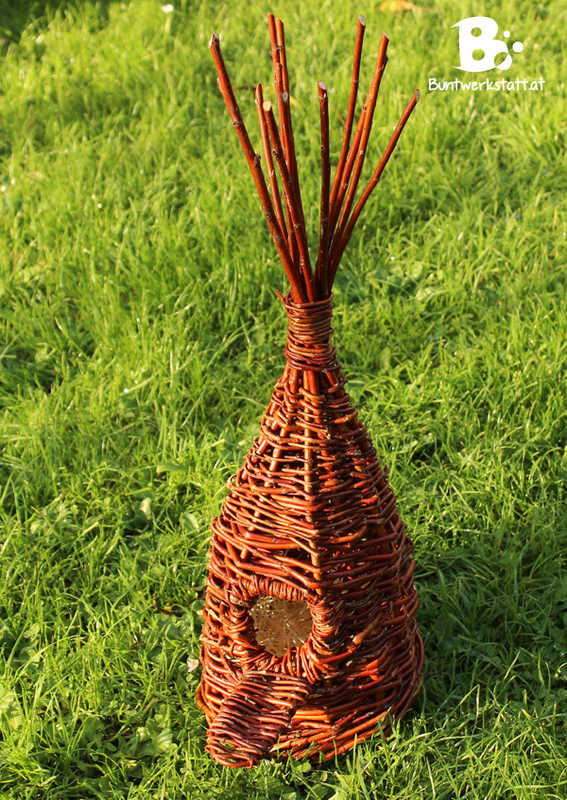 In addition to my Bird Feeders I showed you last time (look here >>) I also made a rustic Willow Birdhouse. 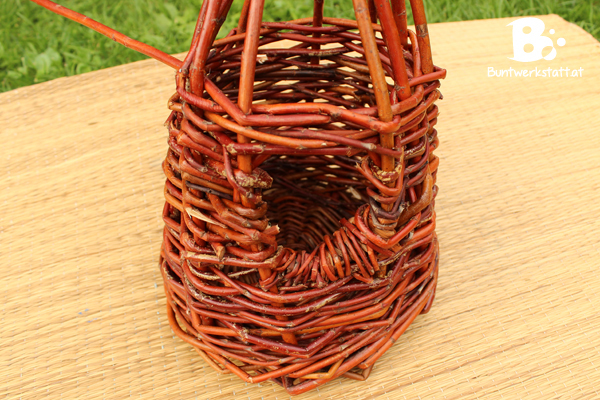 For this birdhouse you will need long, thin willow branches. They should be soaked thoroughly beforehand. Otherwise they will break once you try to bend them. 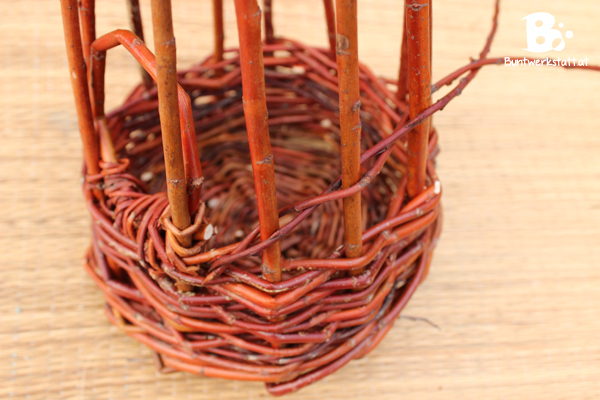 If you don’t have access to willow branches, you can use round reed (available here*) instead. 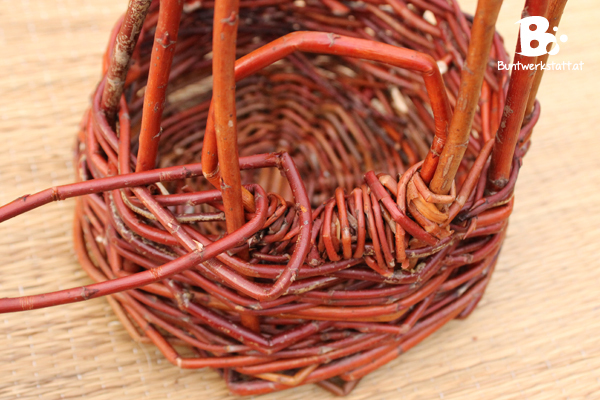 In Willow Weaving we use two different sorts of branches. The ones that are “straight up” support the structure. Those sticks are a little thicker and should be as straight as possible. They are called “stakes”. The thinner and more flexible branches are used to weave between the stakes. They are called “weavers”. 1. You begin with the base. 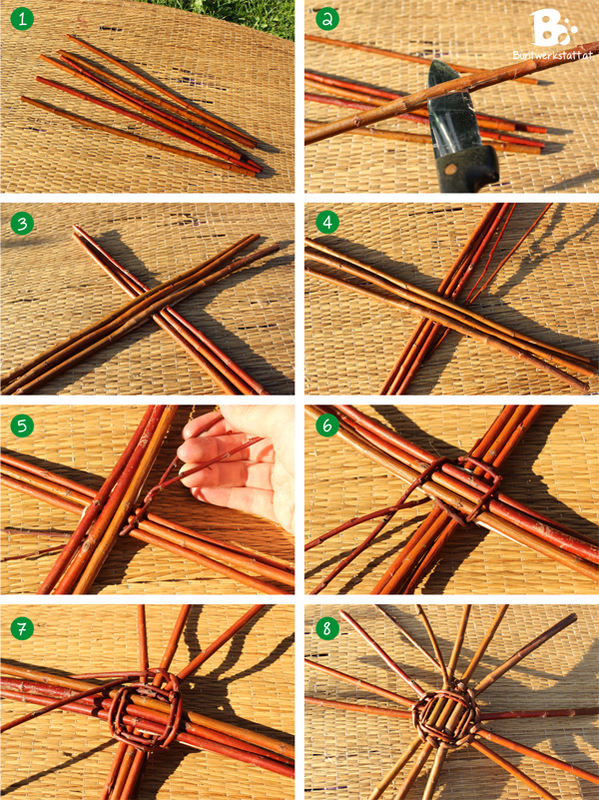 Choose 6 stakes and cut them to a length of 20 cm. (about 8 inches). 2. Take a sharp knife and make a small split at the center of 3 of the stakes. 3. The stakes without the split are inserted through the stakes with a slith. Now you should have a cross-shape. It is called a “slath“. 4. Choose two very long, thin weavers and insert them – thin end first – next to the non-split stakes into the slath. 5. Now you need to do a weaving technique that is called “pairing“. It’s very easy once you get the hang of it. You start counter-clockwise. Take one weaver ABOVE the next 3 stakes and the other weaver UNDER the next to stakes. Now you TWIST one weaver over the other so that they swap places. 6. Continue on like that counter-clockwise arount the slath for 2 rounds. 7. 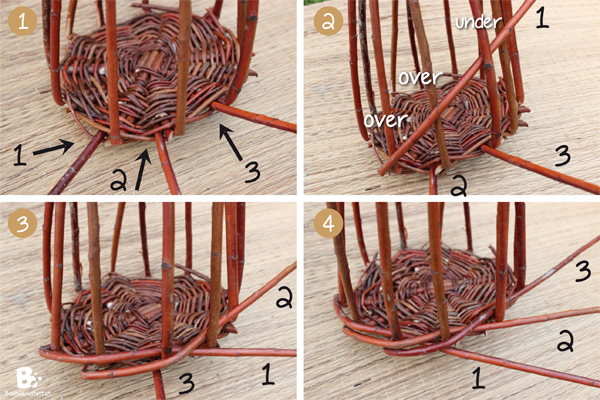 If you have finished your two rounds, you start to twist the weavers after each separate stake. If you reach the end of your weaver you’ll need to add a new one. 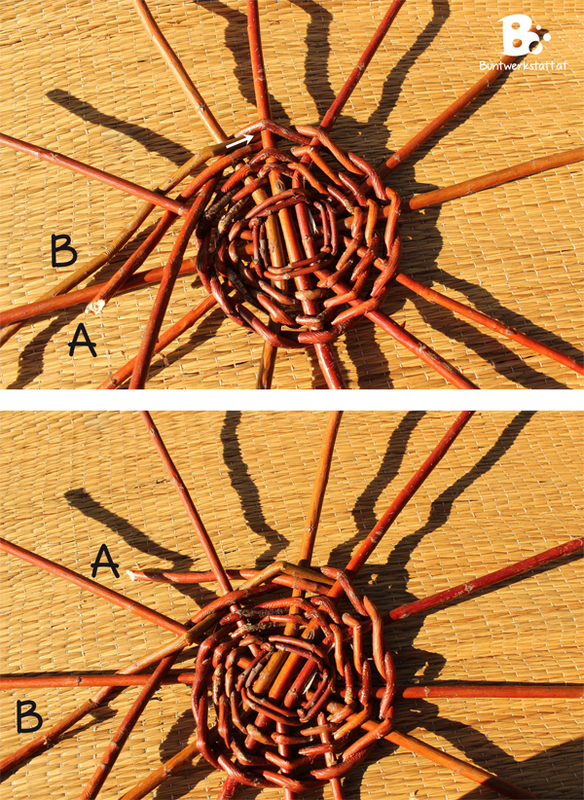 The easiest way to do this is to insert a news weaver (labelled B) between the last twist of the two old weavers. 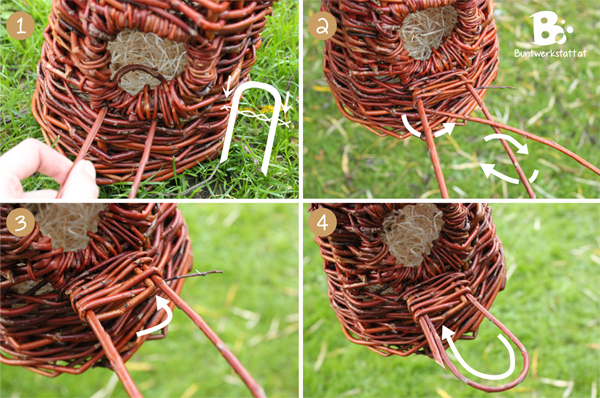 Continue on weaving with the new weaver and cut off the rest of the old weaver (labelled A). 1. Never add two new weavers at the same time. This will create a weak spot. 2. When you replace a weaver, alays add thick ends to thick ends, and thin ends to thin ends. For the sides of your birdhouse you need to “stake up” your base. Choose 12 long new stakes and sharpen the thick ends. Insert the new stakes into the base next to the old stakes. Cut off the old stakes next to the base. Bend the new stakes upwards end tie them togehter with a piece of yarn or some wire. 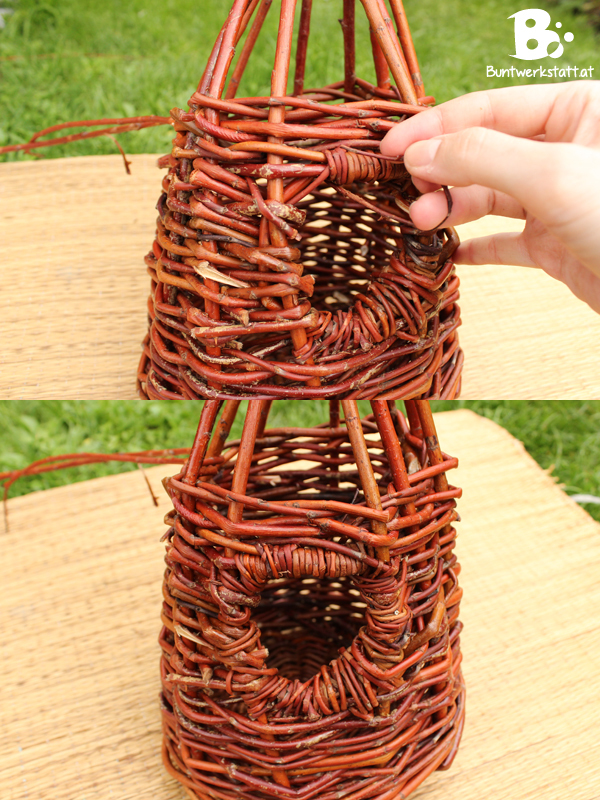 Begin the sides of your birdhouse with a weave that’s called a “Three Rod Wale“. 1. 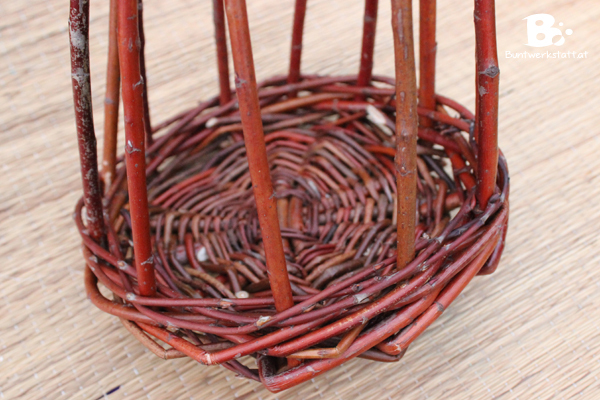 Choose 3 new weavers and insert them to the left of three consecutive stakes into the base. 2. Start with the left-most weaver (weaver number 1) and bend it to the right over two stakes, then behind one stake and back out to the front. 3. Continue with weaver number 2. Again, bend it to the right over two stakes, then behind one stake and back out to the front. 4. Do the same thing with weaver number 3. Then start again with weaver number 2. It is always the same pattern. Pick the left-most weaver, bend it over the next two stakes, then behind one stake and back out to the front. Contiune on with your waling for about 2 rows. (Or until you reach the end of your weavers.) You can see the typical drawstring pattern of the wale. This is how the weaving looks after two rows of 3-rod-waling. Now you can continue to build up the sides of your birdhouse with some pairing. That is the same technique we used to make the base. Choose 2 thin weavers, insert them next to a stake into the wall and start with the pairing. Continue to bild up the wall until it’s time to add a door to your birdhouse. 1. 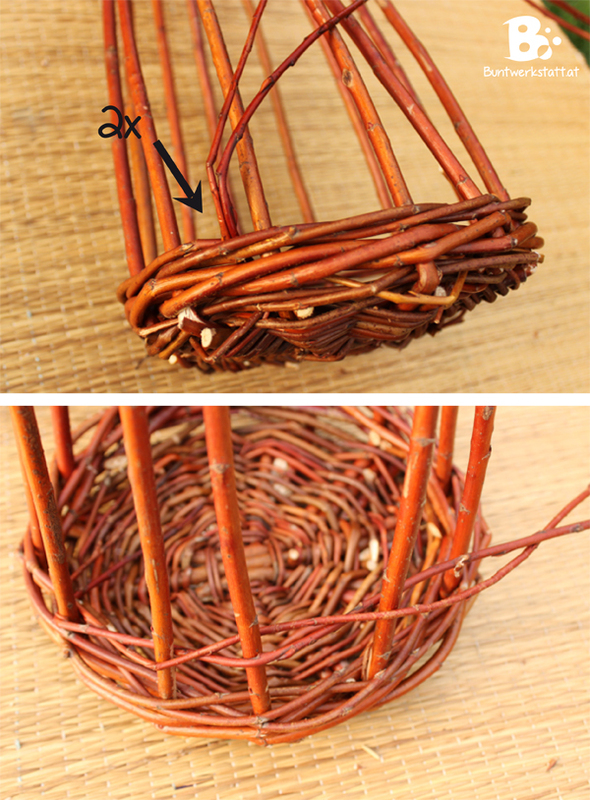 Bend a willow shoot into a loop and tie it together with a relly thin weaver. 2. Place the door between two stakes. 3. Secure the door to the birdhouse with thin weavers. 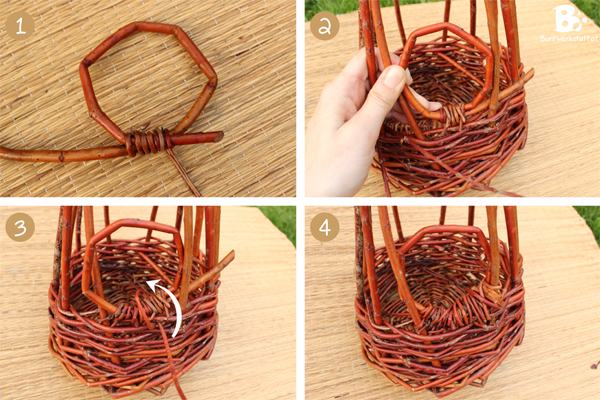 Rope the weaver around the doorframe and thread it through the sides of the birdhouse. 4. Continue on like that until the frame is completely secured to the birdhouse on the bottom. If the doorframe is secured to the birdhouse, you can start again with the pairing. If you have reached the end of a row, thread the weavers through the doorframe and continue on in the other direction. Build up the sides of your birdhouse like that, until the doorframe is completely weaved in. Wrap thin weavers around the doorframe until it is completely covered. The birdhouse should become thinner at the top. Take care to pull the weavers tightly and bend the stakes togehter. If you reach the point where there is hardly any space between the stakes, combine the stakes into groups of two. Tie the stakes together with some thin weavers. If you want to, you can add a little stage to your birdhouse. 1. 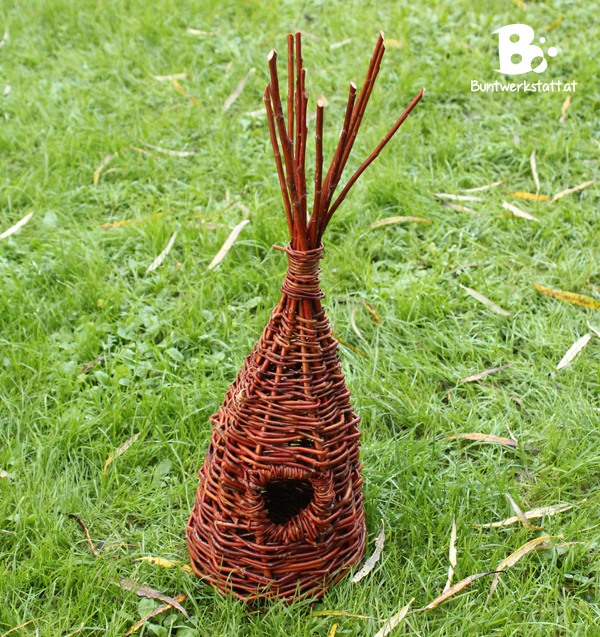 Bend a willow shoot into a loop and thread it into the birdhouse under the door opening. 2. Start to weave with some thin weavers. 3. If you reach the end of your weaver, just insert it into the stage. You can also secure the new weaver this way. 4. After a while you can cut off one side of the frame, bend the other side into a loop and insert it into the stage. Continue with your weaving until your stage is filled out. 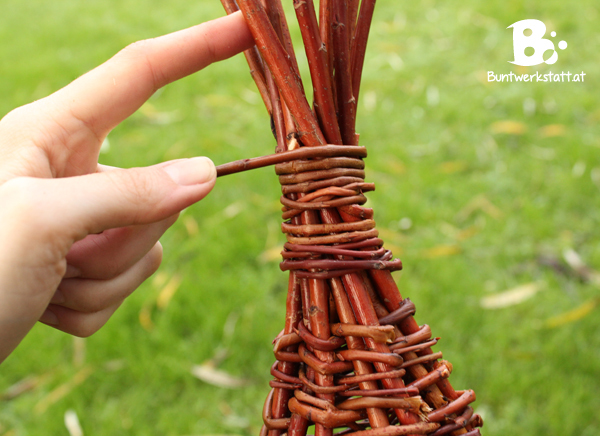 You can use round reed (available here*) instead of willow branches for this craft!